Staying sane during a Canadian winter requires one thing, and one thing only: escape. Some call it March Break, my girlfriend and I call it March Breaking Point - when the cycle of work, chauffeuring kids, nightly meal prep and endless laundry shifts have pretty much done us in. So we now have a midwinter ritual: we pick a weekend, find a destination, and take off. With so little time to spare, we tend to go local. This year, it was Blue Mountain in Collingwood, on the south end of Georgian Bay. Only a 90-minute drive from Toronto, it's just far away enough to pretend our other lives (at least the hectic parts) don't exist. From sun-up Saturday to dusk Sunday, we indulged. Saturday am: By 10 am we were pulling up to Mosaic, our home in the centre of Blue Mountain Village. It was the perfect base for our weekend, with a large outdoor pool for late-night soaks. After settling in, we started our tour at Georgian Hills Vineyards, one of only two wineries in the region. The winery offers a tasting menu that pairs their wines with local cheeses and meats. Co-owner Robert Ketchin got the idea for a winery after watching the local food culture around Georgian Bay develop and mature. "Apples have been grown here for hundreds of years, and chefs like Michael Stadtlander helped us appreciate our local foods. But we still lacked a distinctive wine to go with them," said Ketchin. So with partners in Collingwood and Niagara, vines were planted, and the experiment begun. Turns out, the combination of the escarpment and the moderating temperatures of Georgian Bay make a perfect microclimate for wine. With several successful vintages at Georgian Hills and a second winery not far away, Georgian Bay is effectively Ontario's fourth de facto wine region: all it needs is a few more brave souls to get growing. Their 'Frozen to the Core' dessert wines, made from grapes, pears and apples, are wonderful paired with foie gras, blue cheese, and chocolate-dipped strawberries. Another unique addition to Ontario's wines is 'Perry', a sparkling pear wine, which at just 6 percent alcohol makes a nice light drink, perfect for toasting or as an accompaniment to sushi. It was a real eye opener to see that high quality, innovative wines are being produced here, and it was a great kickoff to our weekend away. Our tasting done, it was now time to get active. But first, a stop for lunch along the way. 1 pm - Ravenna Country Market is a charming country store, with a reputation for making the best soup and sandwiches in the area. Along with Georgian Hills and myriad other local spots, the Market is part of the Apple Pie Trail - a culinary tourism route foodies can explore. Chock full of local jams, sausages, prepared foods and homemade fudge, it's well worth a stop when you're in the area. After stocking up on local honey, baked goods and Mennonite butter we departed to Scenic Caves for an afternoon of Nordic skiing. 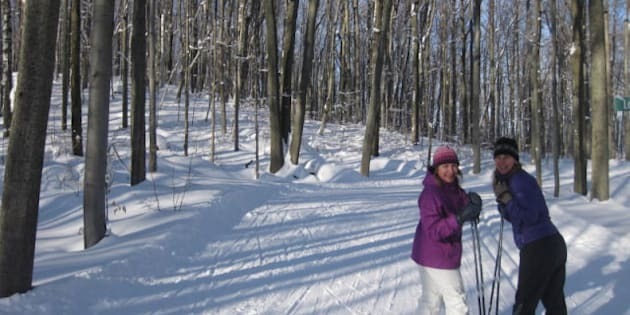 While this adventure park offers year-round activities, including caving, twin zip-lining, hiking, and snowshoeing, we were there to explore its 27 kilometres of nordic ski trails. In a couple of hours, we walked across the suspension bridge, went to the scenic lookout over Collingwood and Georgian Bay, and saw the top of the amazing Thunderbird twin zipline. But mostly it was just us skating along the trails, finding the time to catch up on our families and work lives, while getting some exercise under our belts. By the time the sun went down, we deserved an après-ski treat. Saturday pm: Back in the Village, the streets thronged with people coming off a day of skiing. Blue Mountain does an amazing job of entertaining the crowds that gather here, with outdoor movies, live music and skating on the mill pond. During school holidays like March Break there are fireworks, live music and dance sessions on the Village stage, wagon rides, organized games, scavenger hunts and guided snowshoe walks. We joined the lively crowd at Twist Martini Lounge and picked our poison from a list of 55 different variations. An order of spicy goat cheese rounds gave us just enough energy to get us across the road to the main event - Magnone's Italian Kitchen, an elegant restaurant overlooking the mill pond. With attentive service, an amuse bouche from the chef and a beautifully rendered, classic lamb brasato, we were in heaven. We topped it off with Magnone's tiramisu - a stellar version that reminded us of how great a dessert it can be. All in all, it was a dining experience as good as any Toronto could deliver. By 9, we were ready to call it a night, but not until we had a stroll around the lively village. Skiers were still coming down off the slopes, and the pedestrian streets bustled with families, roaming teens and late-night shoppers. After a little browsing in the shops, our legs gave out. Our perfect day done, we headed home to chill, mom-style, with a chick flick. Sunday am: Ahhh, Sunday morning sans famille. No early morning hockey, no pancakes to make. Nothing to do but find our way over to the spa. Right under our balcony we found a charming little spot called the Royal Majesty Espresso Bar Bakery. Their sweet cinnamon-sugar coated morning buns and delicious coffee were the perfect start to a morning devoted to water worship. Though we could've lingered longer, we wanted to beat the crowds at the very popular Scandinave Spa, Ontario's only outdoor water therapy spa. As we cross the bridge to the main building, a sign reminding guests to Shhhhh! greeted us. In the lobby, we got our first peek at the spa, with steam rising off a series of interconnecting pools and waterfalls, some hot and some cold, landscaped to resemble a natural thermal springs. Surrounding the pools are rustic, barn-like solariums where bathers can relax after a invigorating dip. Co-owner Robert Cederberg checked us in and introduced us to the correct way to enjoy their signature water therapies. It's a simple three-step process: take the heat for 18-20 minutes, then cool off for as long as you can stand it (two minutes is a feat of bravery), and then rest for another 20-30 minutes. Repeat the cycle as many times as you like. If you book ahead of time, you can have a massage, but with or without, your body will thank you. We did three circuits and fell asleep for a bit before we reluctantly had to head back home. Sunday 4 pm: By late afternoon we were back in Toronto, already deep into planning our next mom's break. We don't know where we're going, but we do know one thing: we won't be waiting until March to escape again.